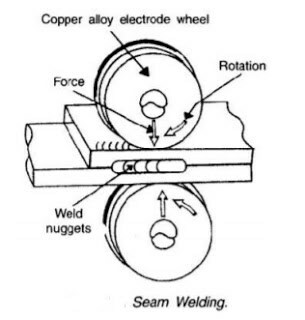 Seam welding is a resistance welding process in which overlapping sheets are joined by local fusion progressively, along a joint, by two rotating the circular electrodes. Fusion takes place because of heat, which is generated, from the resistance to electric current flow through the work parts which are held together under pressure by electrodes. a) The work-pieces to be seam welded are cleaned, overlapped suitably and placed between the two circular electrodes which hold the work-pieces together by the pressure on electrode force. b) Switch on the coolant supply (in some machines, the electrodes are cooled by external spray of water; in others, the electrodes are cooled by refrigerant fluid that flow inside the working electrodes). c) Switch on the current supply. As the first current impulse is applied, the power driven circular electrodes are set in rotation and the work-pieces steadily move forward. d) If the current is put off and on quickly, a continuous fusion zone made up of overlapping nuggets is obtained. It is known as stitch welding. e) If individual spot welds are obtained by constant and regularly timed interruption of the welding current, the process is known as roll (spot) welding. It can produce gas tight or liquid tight joints. Overlap can be less than spot or projections welds. Cost of equipment is high as compared to spot welding set . Welding can be done only along a straight or uniformly curved line. It is difficult to weld thickness greater than 3 mm. It is used for welding of stainless steels, steels alloys, nickel and its alloys, magnesium alloys etc.